owes much of its success to its user-friendly strategy. Besides their open source apps, they have introduced unique and secure encryption algorithms, a quick connection, and 24X7 customer support. The online privacy and anonymity of a user get enhanced by their “no–logs” policy. The 7-day money back offer is in place to give you that extra comfort of giving Acevpn a try! on the facts that turn AceVPN into a global service. locations in over 25 countries. AceVPN’s server network continues to expand in all continents simultaneously. With this kind of efficiency and flexibility, you may enjoy a number of features after subscribing to a plan that suits your needs. you have a huge network of servers to deal with. For those of you that wish to gain an access to geo-restricted websites, it’s good to choose from a long list of countries and hide your IP address at the same time. be able to track your participation in sites like LinkedIn, Twitter, Skype, and Facebook. Apart from this, you may even check out a few video streaming sites, Instant Messengers, and TV channels without any risk of being hacked. Apart from OpenVPN, this service even supports, IKEv2, Stealth VPN, PPTP, L2TP, and IPSEC. and other major services that are geo-restricted. nations.With intelligent routing, the speed of internet never gets slackened. The pace remains the same regardless of whether you’re connecting to PCs, gaming consoles and Smart TV. 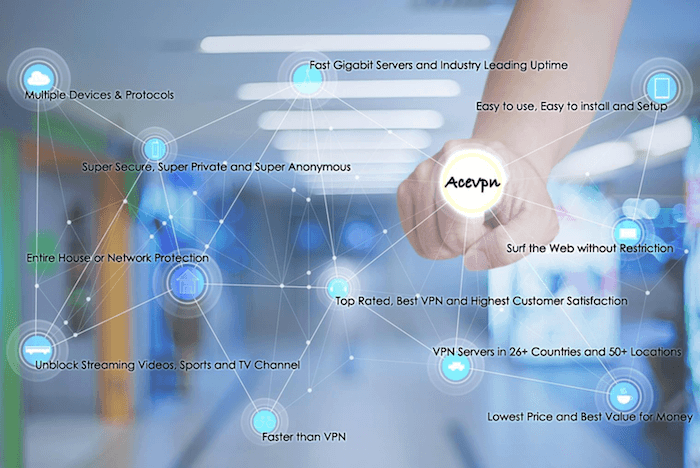 advantages of using a VPN service. You may opt for this service by paying a mere $0.13 per day or $3.89 a month. You may check out with others around and see for yourself if you actually anyone providing these services at such a lower rate. 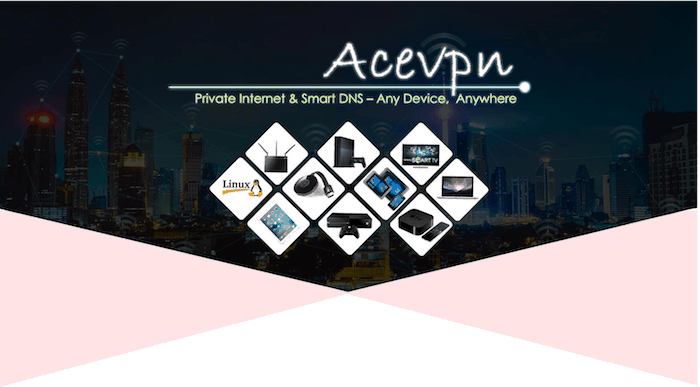 AceVPN doesn’t believe in hiding facts or charging users unnecessarily. You may simply begin using their services by downloading their app from your smart-phone app store.The REAL BIG THING is that you can use this service for a full 7-day trial period and opt for a money-back. pay anonymously for their services through the Bitcoin payment wallets. Their friend referral offer comes with a free VPN and Smart DNS service for an entire month. 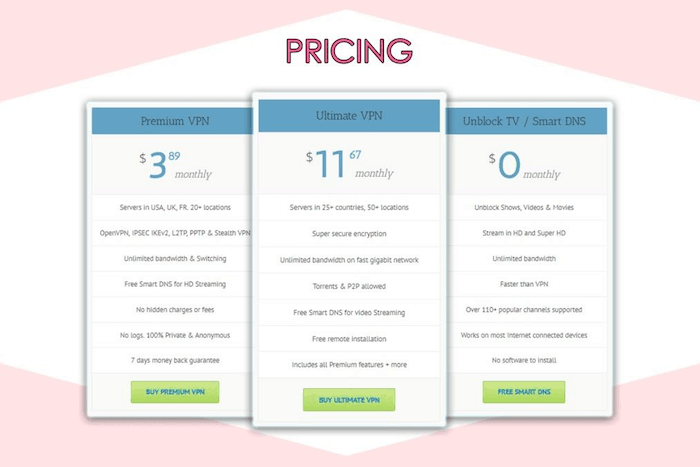 It helps facilitate streaming of videos for your favorite sites and channels besides unblocking your TV for free. and external sources of the network are monitored for threats. websites, you’ll gain a smooth access to your favorite content like Pandora, Sky, Zattoo, BBC, iPlayer, Pluzz, Hulu, Canalsat, Netflix, WhatsApp and Facebook. modern data centers that host their servers. Real-time optimization is guaranteed regardless of your latency, speed, and location. You’ll enjoy customer support through 24×7 besides enjoying 99.9% uptime. AceVPN lays its focus on raising the level of satisfaction for customers. Enjoy guaranteed satisfaction or get your money back. Acevpn doesn’t indulge in bad practices. You’ll only need to share your email address besides your payment details while signing up. You may put a disposable email address at that time. The configurations needs are minimal and it doesn’t need any unique configuration while working with firewalls. It plays safe even when Deep Packet Inspection is used for blocking VPN protocols. Traffic that’s not trustworthy are blocked with advanced firewalls to keep the network and user PCs secured.